Home Events IPL - Indian Premier League 2019 IPL 2019 CSK vs KKR Highlights | Chennai go Top! In what was the decider for the Indian Premier League table’s top spot, it were the defending champions, Chennai Super Kings, that ultimately emerged victorious against Kolkata Knight Riders. Chennai won the match comfortably by 7 wickets. The match 23 was an exact replica of the opening match between CSK and RCB. Once again the spinners were CSK’s heroes of the evening with Harbhajan Singh (2/15) and Imran Tahir (2/21) both playing crucial role in restricting KKR to 79/9. However, it was Deepak Chahar (3/20) who was the pick amongst the Chennai bowlers. However, had Andre Russell’s fighting innings of 50* not been there, the situation could have been much worse. 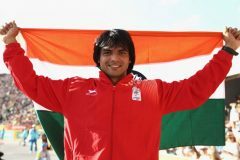 He again proved to be a vital asset for his team. CSK’s Faf du Plessis (43*) then ensured that his team achieved the target with minimum stress. 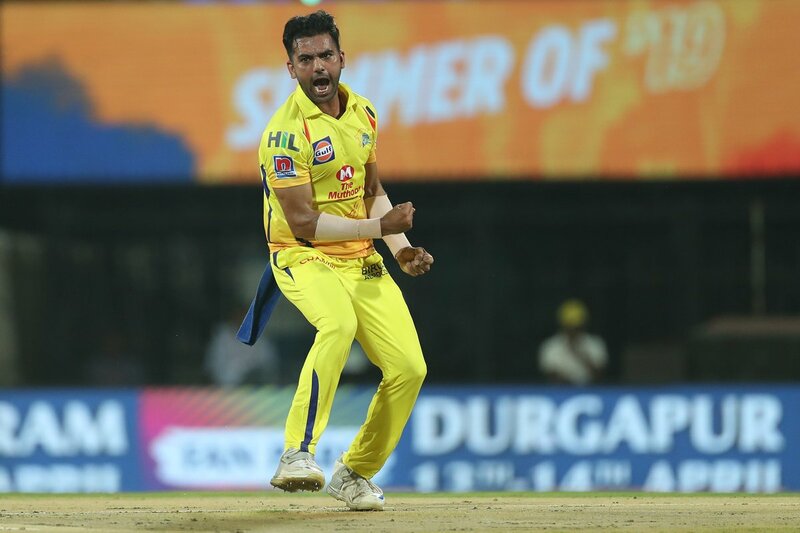 Deepak Chahar, one of the best underrated Indian pacers of IPL 2019? Deepak Chahar is having a fabulous 2019 IPL. The 26-year-old pacer has played a key role in the pace department for CSK in the absence of Lungi Ngidi. In the 6 matches played. He produced a man-of-the-match performance against KKR by dismissing the trio of Chris Lynn, Nitish Rana, and Robin Uthappa within the first 5 overs. He seems to have blossomed under MS Dhoni as one of the most lethal Powerplay Weapons for CSK. Chahar already has 8-wickets to his name, taking him to the third position in the Purple Cap race. However, that is not the statistic that impresses the most. It is his economy rate of 5.97 runs/over that stands out. WIth 73, the Agra native also leads the chart in the dot-balls department. The numbers become more prettier when you consider that they came in the powerplay overs when batsmen usually try to hit the ball hard. Although it may be a tad bit early to label Deepak Chahar as one of the best uncapper players of 2019 IPL, he may well be one of the finds of the season. KKR have one of the better assembled batting line-ups in the league. They have managed to breach the 180-run mark on four occasions in the last six matches. But only one players – Andre Russell – has been the more consistent of the other batsman in the first six matches. Chris Lynn is not having his best season while Robin Uthappa and Nitish Rana are failing to play with the same rigour as during the start of the season. Rana, especially, was the first recipient of the Orange cap, but is now underperforming. This may be an outcome of KKR being over dependent on Andre Russell. Having won more than a couple of matches by his starring performances, the focus never went to the dismal performances by the batsman, especially in the middle order.. Their performances, off-late, have been laced with a sudden ‘’ in this department. Take the match against DC when the team was reduced to 44/4 in the first 8 overs. Or against CSK, when the scores stood at 47/6. If KKR have the ambition to win their third IPL trophy this year, their middle-order will have to be take the lead. It was the fourth over of Imran Tahir and having scalped two wickets, the South African was in the hunt for another scalp. The opportunity came in the second-last ball of his over when the 40-year-old apparently caught Andre Russell leg before wicket. However, after intense appeal, when the umpire didn’t rule it out as an LBW, an excited Tahir straightaway darted towards captain MS Dhoni to ask for a review. Replays clearly showed that Dhoni was unsure about the appeal. But he instantly (and laughingly) took the review upon the veteran spinner’s insistence. Nonetheless, the review concluded that Russell was indeed not out. Deepak Chahar was arguably the player of the match. He dismissed the liked of Lynn, Rana, and Uthappa early to put KKR in a vulnerable position. The spinners took up from there to ensure the opponents do not cross the 120-run mark.